Personalize your meal service and add a pleasing zesty flavor to any dish with these individual mini glass bottles of Heinz Dijon mustard! 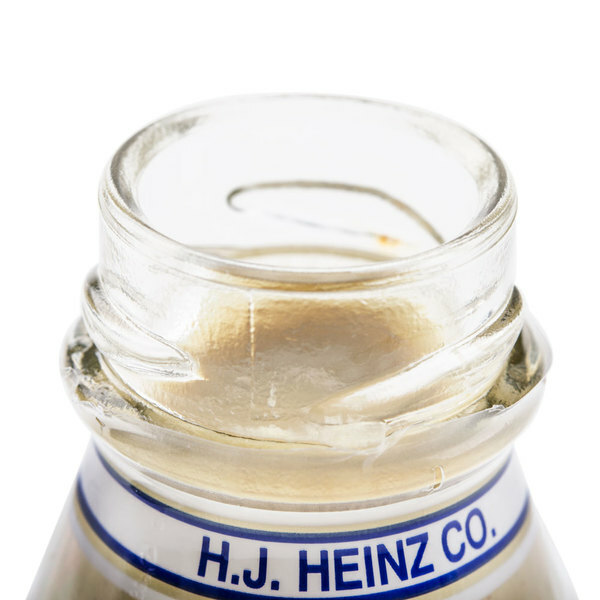 For over 140 years, the Heinz company has been committed to environmental sustainability, community outreach, and great-tasting condiments. Using only the finest ingredients, Heinz makes their Dijon mustard from a rich blend of tart vinegar, mustard seed, white wine, and spices. Compared to traditional tangy yellow mustard, Dijon mustard provides just the right amount of spice and heat to mild fried foods like chicken strips. It's also great as a sandwich spread or as a dip for soft cheeses. Your guests are sure to fall head over heels for this smooth, semi spicy condiment packaged in petite yet iconic glass bottles! 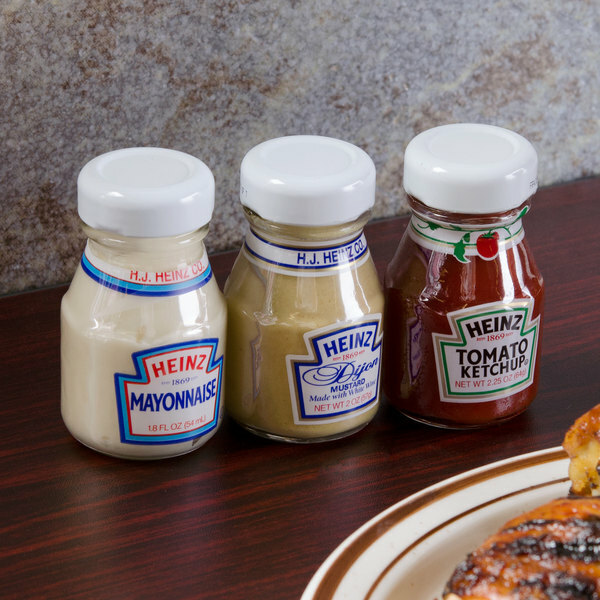 Trust Heinz for your condiment supply, and serve these individual mini bottles as part of your superior room service or bed and breakfast service. Also great for high end hotel or restaurant use, they have a uniquely upscale look that's sure to charm your guests. Providing portion control so your guests will have just the right amount of Dijon mustard that they need, these glass bottles are certainly a step up in appearance and quality from portion control packets! Very comparable to Grey Poupon in quality and taste at a better price! I will never switch brands after tasting Heinz's dijon mustard. The bottles are perfect for indiviudal uses at any restaurant or party. I would purchase this again. A really nice tasting Dijon mustard from Heinz that is great to spread on sandwiches and top sausage dogs. The mini bottles are great for serving at parties. The classy party thrower's option! So much nicer than packets everywhere. I do struggle with getting some of it out of the jar, but the look is worth it. Had these included in a sandwich to-go bag at a picnic. Neck of the bottle is wide enough for plastic knife, avoiding mess. Not to mention the product packaging is very appealing. I've seen restaurants move to this product over the traditional packets. Recyclable is another perk. Did not think that this company still made this in the small bottles. We had been looking everywhere for it and we are happy that we found it here. A top notch produce in a very cute mini bottle that makes our deli stick out among the competition. The Dijon mustard has a great flavor and the price is perfect. 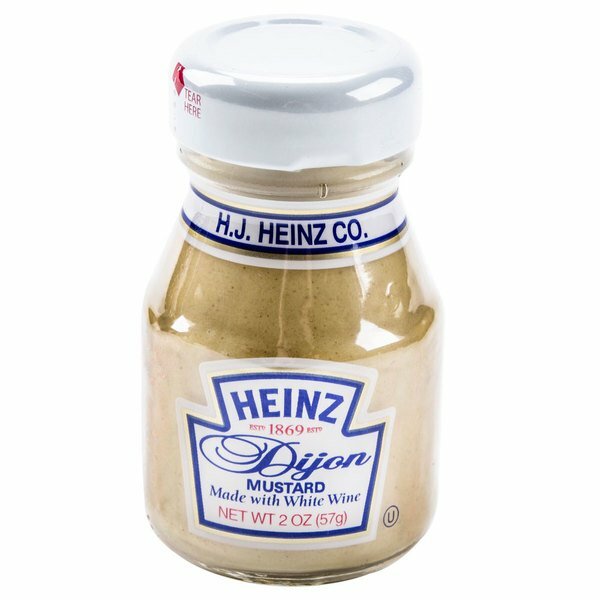 Heinz Dijon mustard 2 ounce mini bottle. When delivered will arrive 60 jars in a case box. This Dijon is perfect for combining with chicken strips and even with your market fresh cheeseburgers. clients will definitely love your recipes as added with this dijon mustard. I love Dijon mustard despite it's very peculiar flavor. It is strong, but in the right quantity it is delicious. These jars are adorable and would look great displayed. 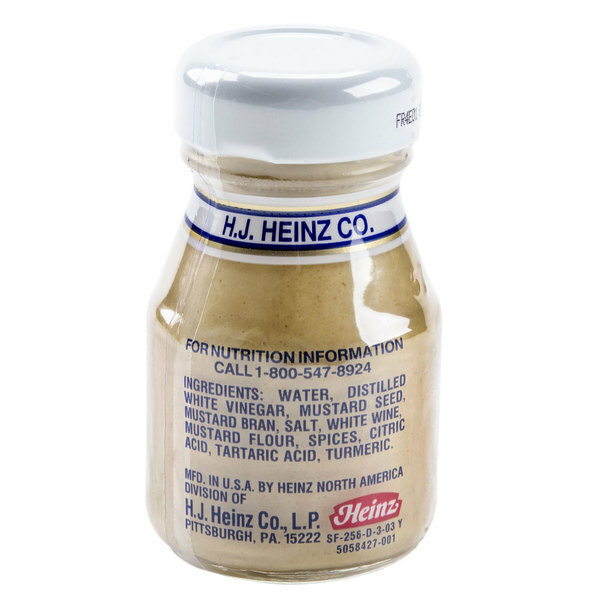 These are great to provide a personalized bottle of Heinz Dijon for your customers. They are individual sized and taste great. They are cost effective and a great way to satisfy your customer's needs. These little bottles are so awesome to take out for picnics. We made a bunch of picnic kits for the whole family and put these little bottles in there and everyone loved it. Very good mustard, comparable to Grey Poupon, but in my opinion, tastes better ...... the small serving jars are perfect for making the dining experience more personal feeling ! 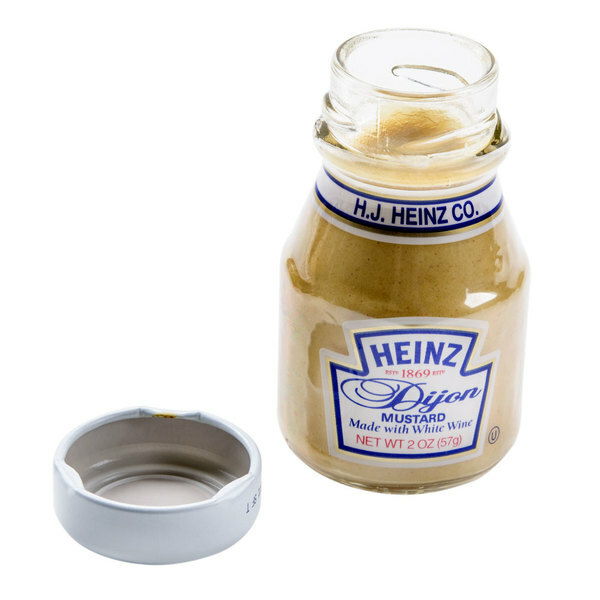 The Heinz Dijon mustard is a classic delicious mustard that is great on subs. The small mini bottles are too cute and make a great display for company luncheons. A very good Dijon mustard that comes in a cute little 2 ounce glass bottle. The jars are great for serving in our sandwich basket meals. I love using Dijon mustard in vinaigrettes. The fact that Heinz sells it in these small glass bottles makes it that much more appealing. Everything tastes better when it's cute. Tastes great. Perfect for our chicken sandwiches! Nice individual size and upscale look! Awesome product and good price. Customers love having a name brand like Heinz! Dijon mustard is not for the faint of heart. It's got a definite burn but is very delicious. These mini bottles have wedding favors written all over them. I can see them on a pretzel station already. Heinz makes an awesome Dijon mustard. It's nice and pungent and accompanies pork dishes really nicely. The flavor really compliments smiley bacon too. These mini jars look so much nice than the larger ones. These looked awesome at our wedding. We had a soft pretzel stand and served these alongside them which really impressed our guests. I want to throw more parties just so I can serve these. This is a wonderful item that we use in our gourmet baskets. Of course we had to open one to sample the mustard. I am proud to send these out and know the recipient will totally enjoy the great looking bottle with a wonderful product inside. We combine the mustard with three different flavors of jam/Jelly in the one ounce size. The colors all blend together and make a wonderful impact in our presentation.